A 2 minute walk to SkyCity Coach Terminal for long distance coach service to and from Auckland and SkyCity Casino and a 25-minute walk to Viaduct Harbour, the Quest on Hobson has stylish modern self contained apartment style of accommodation in the heart of Auckland. Each studio, 1 and 2 bedroom apartments have satellite TV, cooking facilities and a work desk. Quest on Hobson Apartments are right across from the St Matthews-in-the-city Church and a 10 minute walk from Queen Street. and . Studios with an open-plan living area, kitchenette and private bathroom are available. Each spacious apartment features a full kitchen, private laundry and spacious living room. Guests can dine at selected local restaurants which can have your meal costs added to your room bill. The hotel also has a grocery shopping service. Several of Auckland’s best shops, restaurants, bars and theatres are within a 10-minute walk of Quest on Hobson Auckland. 3 minute walk to SkyCity Coach Terminal for long distance coach service to and from Auckland and a 10 minute walk from Queen Street, the Skycity Grand Hotel Auckland has contemporary 5-star rooms and suites with views of Auckland Harbour and the city skyline. Guests enjoy award-winning restaurants, a bar, a fitness center and a luxurious day spa. Guests enjoy free Wi-Fi. The Skycity entertainment complex, featuring a 24-hour casino, Auckland’s iconic Sky Tower, and more than 20 restaurants, cafes and bars, is right at the property's doorstep.The fully-equipped fitness center includes a 80-ft heated lap pool, Each room at the Skycity Grand Hotel Auckland includes a modern bathroom with bathrobes and a separate bathtub and shower. There is a flat-screen TV with in-house movies in every room. Gusto provides a delicious breakfast. Bellota, The Grill by Sean Connolly and Depot on Federal Street provide award-winning dining options. A 10 minute walk from Queen Street, 3 minute walk to SkyCity Coach Terminal for long distance coach service to and from Auckland and next to the iconic Sky Tower and SKYCITY Casino, SKYCITY Hotel Auckland features is a 4 star hotel with beautifully furnished rooms and suites with free Wi-Fi, a 37-inch flat-screen TV and an iPod docking station. The 24-hour SKYCITY Casino showcases live entertainment, a theatre and a choice of more than 20 restaurants, cafes and bars. The Sky Tower, rising 1,076 ft above sea-level, offers breathtaking 360 degree views from 3 observation levels. Each air-conditioned room includes a private bathroom, minibar, satellite TV and 24-hour room service. All rooms have a view of the courtyard, city skyline or Auckland Harbour. Fortuna Restaurant serves modern Australian and international cuisine and has a buffet breakfast menu. A 10 minute walk from Queen Street, 6 minute walk to the SkyCity Casino and SkyCity Coach Terminal for long distance coach service to and from Auckland, the Econolodge City Central is a standard 3 star hotel with ensuite hotel rooms that TV and a private bathroom with shower only with a hairdryer. Ironing and tea and coffee-making facilities are included. Select rooms feature air conditioning and a balcony. Econollodge City Central’s 24-hour front desk provides luggage storage and laundry services. Guests can use the business centre or make travel arrangements at the tour desk. It houses a breakfast café and offers Wi-Fi access. A 10 minute walk from Queen Street, 6 minute walk to the SkyCity Casino and SkyCity Coach Terminal for long distance coach service to and from Auckland, the Best Western President Hotel Auckland is a standard 3 star hotel featuring spacious accommodation, a fitness room and fully equipped meeting facilities. All studios, suites and apartments at President Hotel Auckland include kitchen or kitchenette facilities, air conditioning and a 32-inch LCD TV with satellite channels. Watergate Restaurant has both a full buffet breakfast and a dining menu each morning. There are a wide variety of drinks available from the hotel’s bar. Guest facilities include a tour desk, car rental service and laundry facilities. A 10 minute walk from Queen Street, 6 minute walk to the SkyCity Casino and SkyCity Coach Terminal for long distance coach service to and from Auckland, the Crowne Plaza Hotel Auckland is a 4 star hotel with ensuite rooms that are modern and well-furnished with modern amenities. The club lounge, with complimentary drinks and snacks, are available to some guests. There is Wi-Fi available throughout the hotel. There is a comfortable lounge and bar. The restaurant serves international cuisine, throughout the day. Breakfast can be served in your room. A 12 minute walk from Queen Street, 10 minute walk to the SkyCity Casino and SkyCity Coach Terminal for long distance coach service to and from Auckland, the Heritage Hotel Auckland is a 4 star hotel offering stylish accommodations with satellite TV. It features 2 fitness centers. Guests receive 60 minutes of free Wi-Fi in the lobby each day. 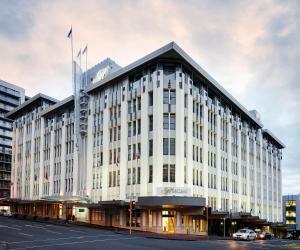 The Heritage Auckland offers an indoor pool, a tennis court and a hair salon. The Beauty Space features a range of facials and body treatments. 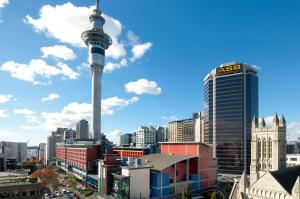 Heritage Auckland is in the heart of Auckland, a 20 minute walk to Viaduct Harbour and Queen Street. The award-winning Hectors Restaurant is in the hotel's impressive 7-story atrium, and features innovative Pacific Rim cuisine based on local organic produce. The Lobby Bar offers tapas and refreshing drinks in a relaxed environment. All air-conditioned rooms at Heritage Hotel Auckland are elegantly decorated, and have a refrigerator and tea and coffee making facilities. Most rooms also have a full kitchen. A 12 minute walk from Queen Street, 10 minute walk to the SkyCity Casino and SkyCity Coach Terminal for long distance coach service to and from Auckland, The Auckland City Hotel is a standard 3 star hotel in the heart of the Auckland central business district and within a 3-minute walk of Sky City. The hotel lobby is inside a 1912 heritage building and the 10-floor extension contains 138 modern ensuite guest rooms. Guests enjoy one hour of free Wi-Fi per day. All rooms have a work desk, a refrigerator and tea and coffee-making facilities. Studio rooms include a kitchenette with a cooking stove and microwave, and the 2-bedroom suites have a full kitchen, a washing machine and a dryer. The Mustard Seed Café and Restaurant features beautiful high ceilings and serves authentic Malaysian cuisine as well as standard breakfasts. The restaurant bar also has a range of espresso coffees, wines and liqueurs.